Hey 2 minor, that is a beautiful instrument ! Thanks for sharing your build thread, it's been very exciting to see it all come together. Hearty congratulations! Some dear friends have a place in Uzès, but the wife and I have not yet managed to avail ourselves of the open invitation to spend some quality time with them down there. The day we do, I'll be sure to try and arrange a visit to Bryant's shop. I thoroughly enjoyed the short video where he talks about the journey that's brought him this far in life. Every Trenier I have played is beautifully balanced between the nut and the very last fret and will accommodate anything you throw at it. Some more Argentine Gaucho Chords by Brandon Scott Coleman.. I don’t see any first position chords!! The guitar sounds amazing with open chords actually. 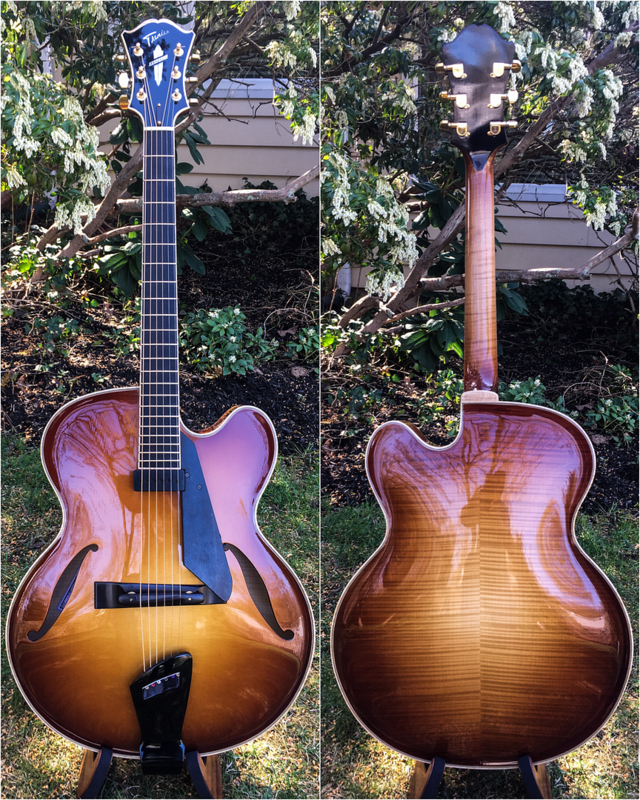 This archtop has tremendous sustain and supreme string to string clarity and strong trebles all the way up the neck. The recordings were made on my iPhone in a loud environment and can’t begin to convey its timbre. Archtops are indeed different beasts than flat tops but they do certain things really well. Good ones have supreme balance in volume across the strings, great string-to-string separation and maintain strength in their timbre all the way up the fretboard. This one has all that plus added sustain and a nice touch of added overtone warmth. It is a fantastic soloist instrument. Bryant is doing his own thing, but is no doubt very much influenced by the direction the late Jimmy D’Aquisto was headed in the late 1980’s and early 1990’s. For a 17” instrument with thick plates, a rock maple neck and many ebony appointments it is quite light at 5.8 lb. the 25-1/4” scale is a nice balance between the power of a long scale and the ease of play and sweetness of a short scale. You can see in the photo below that Bryant continued to shape the bridge base (tapered now towards treble side) after he assembled and strung up the guitar. This is part of his build process to customize components of the guitar based upon playing it. The Kent Armstrong 6-pole piece single coil floater does work even though the guitar has bronze strings on it. It has a clear, but warm tone to it amplified. It is set up at 7,000 ohms (there are two settings on this pickup: 7,000 ohm and 10,000 ohm) and has volume and tone pots under its finger rest. I will hold my thoughts on that until I get a set of nickel strings on the guitar. As impressive as this guitar appears in photos, it is much nicer IMO in reality. Love that headstock. What a beauty! There are very few non-flatop guitar builds chronicled here in the AGF Custom Shop. I am happy to have shared a few builds here because while archtops are slightly different “animals” than steel stringed flat tops, they acoustically do certain things particularly well, are beautiful and to me represent the pinnacle of guitar lutherie. Here’s a family shot of my three archops: my 16” Comins Classic Archtop (humbucker + Barbera); 17” Trenier Artifex Archtop (single coil); and 3) 16” Comins Zelig Slope Rimmed Archtop (acoustic). Bob, you have IMMACULATE taste in wood selection! Thanks Justin, but the credit honestly goes to the luthiers, not me... . These three archtops are actually all different in their wood selection. 16” Comins Classic has a Carpathian Spruce top from Romania and a Fiddleback Bigleaf Maple back and sides from the Cascades. 17” Trenier Artifex has an Italian Alpine Spruce top and Fiddleback Bosnian Sycamore Maple back and sides. 16” Comins Zelig has a Carpathian Spruce top from the Ukraine and Fiddleback Honduran Mahogany from Belize.